This book is an excellent training manual for anyone interested in learning how to make money as a trend follower. 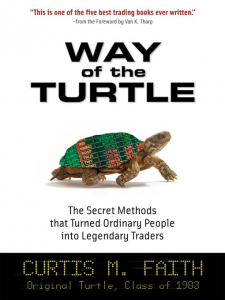 I know a bit about trend-following because I was part of the famous Turtle experiment in the 1980s when Richard Dennis, the Prince of the Pits, showed the world that trading could be taught and that people with the right sort of training and perspective could make consistent returns that far exceeded normal investments. Ultimately, that ordinary people could learn to trade like the most successful hedge funds. I started as a 19-year-old kid and by the time I was 24 in 1987, I took home $8 million, which was my cut of the $31.5 million I earned for Richard Dennis as a trend follower. I even wrote a book about it, Way of the Turtle. It became a bestseller because many traders wanted to know the secrets of our success and to hear about the story first-hand that had been kept secret because of confidentiality agreements and our loyalty to Richard Dennis, a great man and a trading legend. I’d thought about writing a follow-on book a few times in the intervening years; something meatier and with more detail. My book was part-story and part-trading manual and I thought about writing a book that was all trading manual. Andreas Clenow has written, in Following the Trend, a trend-following trading manual I would be proud to put my own name on. I’m very picky too, so I don’t say this lightly. Very few trading books are worthy of an endorsement of any sort. Too many are filled with tips and tricks that don’t stand the test of the markets, let alone the test of time. Too many are written by those who are trying to sell you something like a course, or their seminars. Too many want your money more than they want to create an excellent book. That’s why I don’t often speak at conferences and you won’t see me endorsing many books. There is too much self-serving propaganda in the trading industry that makes its money by fleecing the unsuspecting newcomers; too many lies designed to rope in the neophytes with promises of easy profits and quick money that will never pan out. Following the Trend is different. It is solid, clearly written, covers all the basics, and it doesn’t promise you anything that you can’t actually get as a trend follower. If you want to be a trend follower, first, read Reminiscences of a Stock Operator to learn from Jesse Livermore. Then, buy Jack Schwager’s Market Wizards books to learn about the great traders who have been trend followers, like Richard Dennis my trading mentor, Ed Seykota, Bill Dunn, John W. Henry, and Richard Donchian. They will get you excited about the possibilities but leave you wondering how; how can you too learn to be a trend follower? Then, when you are ready to move from desire to reality. When you are ready to do it yourself. To make your own mark. Mr Clenow, are you aware of these comments regarding Mr Faith? You seem like an honest person, so I would be interested in your view of the above? That page says quite a lot about the moral and professional integrity of the person who maintains that site. Quite amusing that I appear to be listed as “Known associate” of someone I never met, never did business with and spoke to only once over Skype. I also know for a fact that Anthony Garner has never met or done business with Curtis. Makes you wonder about the accuracy of the rest, doesn’t it. This is a character assassination page, and quite a childish one at that. I don’t know and don’t care about the allegations on that page. Someone with a very interesting real life experience 30 years ago wrote the forewords to my book. If a system salesman wants to write a page about how his life turned for the worse in later years, that’s really none of my business. What you need to ask is what kind of person would make such a page, just to discredit people who disagree with him. I agree. Curtis won’t be the first or last trader to fall on hard times. That doesn’t take away from what he helped do 30 years ago. All traders need to adapt to modern times. As for Covel, I like his books but would never pay him or anyone thousands for the kind of info you give it out for free. Thank you for this great site. I'm booked for speaking in Melbourne in November 2019. Do you know of any good conferences near you? Let me know. Are you trading or gambling? Sign up for the FREE Clenow Research Newsletter!